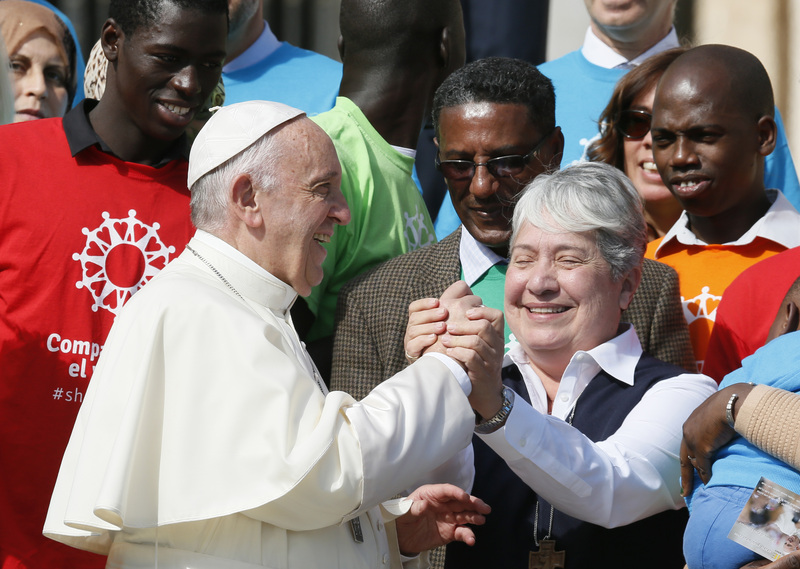 Sister Norma Pimentel is enthusiastic about the “Share the Journey” campaign, organized by Caritas Internationalis, and launched by Pope Francis on Sept. 27, to help families and individuals who are forced to leave their homes and migrate to another country. She hopes it can help remove fear from the hearts of people in the United States about immigrants, and open them to meeting and getting to know immigrants as people like you and me. That is what she told America in this exclusive interview after the press conference in the Vatican, in which she was a member of the panel that helped Cardinal Luis Antonio Tagle, president of Caritas Internationalis, present the campaign to the international media. Born in the United States but raised in Mexico, Sister Norma knows a lot about the situation of migrants in the United States. For the past 10 years she has been executive director of Catholic Charities of the Rio Grande Valley, Tex., which is the charitable arm of the Brownsville diocese. Sister Norma has been an energetic advocate for migrants’ rights for many years. In 2014, she was instrumental in mobilizing resources to support the surge in refugees from Central America seeking refuge in the United States, and setting up a humanitarian respite center in the town of McAllen, Tex. At the time 130,000 people—half of them children on their own—crossed the Rio Grande in just a few weeks. In 2015, she made news when Pope Francis singled her out during a virtual papal audience ahead of his visit to the United States, hosted by ABC. Through her, he transmitted a message of thanks and love to all the nuns in the United States. How do you think the Caritas campaign will impact the United States? I think the campaign is a great opportunity for us, especially for the Catholic Church, to promote and encourage others not to be afraid, to welcome, to understand why [migrants] come, and not simply block the idea that they are people, they are human beings like you and me. So, I think the campaign will be an opportunity for parishes, for dioceses to promote all of this, and to help others not be afraid but rather to be an instrument of faith, an instrument of hope for those that need us and are here already. We need to try to understand their reality. The campaign is a great opportunity for us, especially for the Catholic Church, to promote and encourage others not to be afraid. In other words, to bring down the barriers in the hearts and minds of people. Of course, of course. There are so many barriers that we create ourselves out of fear, out of the unknown and that’s why we sometimes reject the immigrant who is many times criticized or looked at as a criminal, but they’re not. I’ve experienced this personally because I see them at our center, I hear their stories, I see their faces, and I know they are people. And anyone who comes and sees that has been transformed and has gained an understanding of what they should do with these immigrants. You’ve worked a long time in this field. What do you see as the main blocks to the acceptance of immigrants? One of the blocks that I see is the indifference, that we kind of put ourselves in what I would describe as a bubble, that keeps me from really feeling, or seeing, or experiencing anything beyond that, because I protect myself to be safe. So, when I allow myself to break the bubble, I am able to go into a relationship with others that are not threatening to me. But I will not do that unless I break away from those things that keep me from believing that there’s more life and goodness beyond what I’ve allowed myself to believe. I think that’s one of the things that keeps people from reaching out, from welcoming, from caring for others that may need them. Not knowing, not understanding, or being so defined as to what they believe, and they don’t want to change that. They don’t give themselves the opportunity to learn something different or to meet something different and to understand that life may be offering something good. Is it not also true that people fear that the immigrants will impact their pockets, in other words that they will be poorer because of the arrival of immigrants? There’s a lot of things that are being put out there that create fear among the population in America. Say if one immigrant killed somebody—they say you allowed them in, they’re going to kill us all, we’re more in danger, they’re going to take our jobs. I don’t believe that’s true. Yes, there are bad people everywhere, and our law enforcement agencies are there to take care of us as communities and to protect us, not just from the immigrant that is criminal but from every criminal that exists in our communities. [People fear] that immigrants are going to take our jobs or money, but they come to contribute, to make our economy better, to really enrich us because many of them come with great hopes of working and making a difference in their lives. As a United States citizen, it embarrasses me that we cannot have a better option for children and for mothers and for infants that are here. You spoke earlier at the press conference about your experience with children in detention centers, and in a message earlier this year the pope called for an end to such detention. How do you feel about this? It’s so sad, it’s heartbreaking to see children in conditions where they are detained like criminals, and kept there not just for one day but sometimes for weeks. Now they’re processing them faster, but children should not undergo those conditions. As a United States citizen, it embarrasses me that we cannot have a better option for children and for mothers and for infants that are here, and that we can’t treat them in better conditions—because those are not good conditions for any human being, much less for a child or a mother. Are you hopeful that this two-year long campaign from Caritas, apart from opening hearts and minds, will also spark new creativity in challenging the system in the United States for the way it treats women and children immigrants? I certainly hope so. We have always to hang on to hope, because that is what keeps us going. This campaign is going to help us bring this news, bring this experience, so that there is not that fear, and that people are open to be part of a more humane response to immigrants.